Sometimes I believe a higher power is speaking to us. Sometimes I believe we choose to listen and other times we do not. The past 6 months I have spent a lot of time trying to listen, because I believe there are lessons I am supposed to be learning right now. 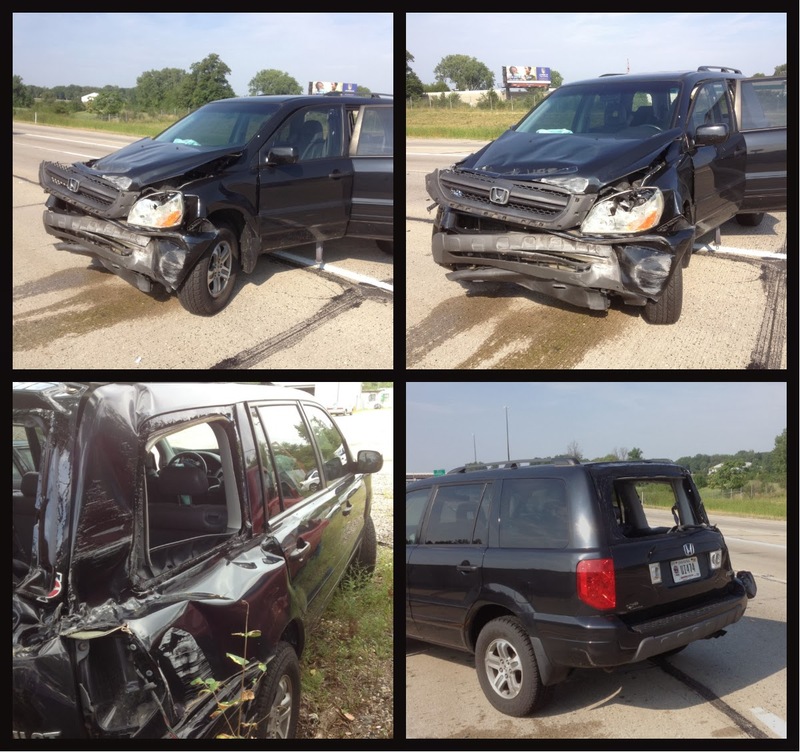 In July 2013, my family and I were in a very bad auto accident on an interstate here in Indianapolis with a semi. We were hit on the passenger side causing us to do a 360 degree spin only to go crashing head first into the cement center wall and bounce off coming to a stop sitting sideways in the middle lane of a 3 lane highway. By the grace of God no one else was involved but us and the semi. We were very fortunate to walk away from the accident with nothing but bruise...bad bruises, but I was very thankful for my bruises. The pain I felt let me know I was still living and breathing. For that I am forever grateful. In September 2013, just as my husband and I were starting to be able to drive down the road and not jump at every little movement the cars around us made, our neighbor and friend of 10 years was killed in an auto accident less than 3 miles from home. We were there when our neighbor received the news, we heard the screams, saw the tears, felt the pain and held her and her son tight. Todd and I were devastated. For weeks we both found our selves crying and trying to make sense out of what had happened. Why would God take a loving father from his wife and child of 5 years old? Why were we so lucky? Why were we spared? The questions still continue. There is not a day that goes by that I don't think of Mike at some point. It's these 2 incidents that made me take a LONG, HARD look at my life and REALLY rethink what is important to me. What have I learned from this? Life is short. We are not promised tomorrow. Tell those you love that you love them and tell them often. Cherish the small moments, good or bad. Breath every day in deeply. Slow down, life is NOT a race. It's not about the money you make or the number of promotions you get, or if you are driving the best car or wearing the best clothes or living in the best house. None of this matters, because in the end, it's about your and your family. They don't care about any of these things, all there care about is you loved them, cared for them and were there for them. We are all only here for a short while, make the most of it while you are here. Tomorrow could be your last day! These are the lessons I have learned. For the past 3 years I have been working a part time job (25 hours a week), trying to build a business (The Pauper's Castle), volunteering as a Walk Coordinator for the Preeclampsia Foundation, trying to be a wife and a mom. What I realized is, the two people that mattered most to me were the ones that were getting the least amount of my attention. I had it all backwards. I still have to work part time. Our family depends on my income. The Promise Walk is way to important to me to not continue. So, I decided to shrink our business back down to one location (Main Street Shoppes) and stop being a retailer for American Paint Company. I wanted to have more time for my daughter and my husband. So far, this has helped tremendously. 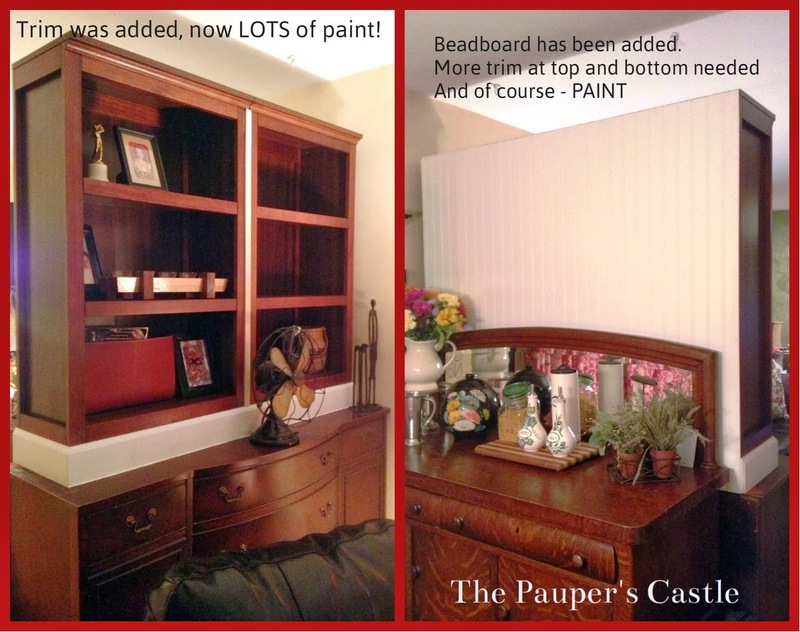 We have actually been able to make some improvements in our own home! I kind of forgot what this was like. It's been fun taking back our humble abode. We are working a major overhaul in our family room. This room is the hub of our family activity. And let me tell you...this room is small compared to most family rooms. It's 12 x 16. Not only is it a family room, but it's also the play room. So we have been working very hard to find some creative ways to stash the toys so it can be an adult space as well as a kid space. Over the next several weeks, I will be sharing this adventure! If you follow me on Facebook, you have probably already seen the finished project of the buffet wall, but for now, I will share the beginning stages! I am so glad you all are ok from your devastating accident Kellie!! My husband was involved in a 3 car accident in 2003 where the vehicle he was in, rolled 3 times on the Interstate between Las Vegas and Palm Springs. I know the scream you talk about from your neighbor's experience- I thought I watched him die right in front of me. Fortunately, they too walked away with minor injuries. But I also do not take anything for granted anymore. I'm so glad you are doing what is important to you, and that you have a new purpose and outlook. Blessings to you and your family this year.